Hue Décor offers one of the largest selections of wallpaper in Edmonton. Whether it’s wallpaper for a feature wall in a bedroom or a downtown nightclub, we have thousands of patterns to choose from. Our staff are here to help you pinpoint the look you want and find paint colours to match. Need a second opinion? Sign out our books to get a sense of what the wallpaper would look like in your space. We offer competitive prices. We also offer designer and builder discounts. 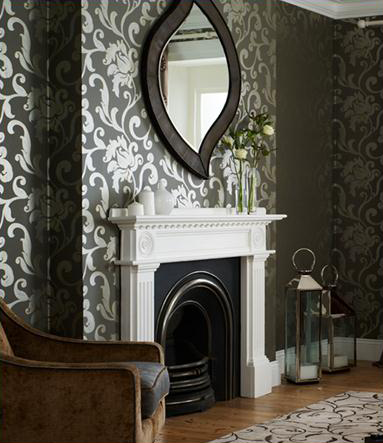 Our knowledgeable staff is always available should you require answers to any questions you may have about wallpaper. Get the look of real barn wood affordably and with ease. 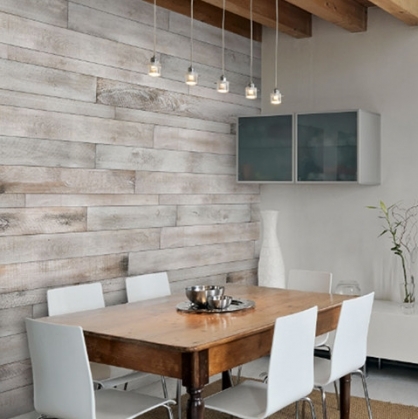 Within minutes you can create a trendy feature wall by simply gluing or air-nailing the AS-IS boards to any wall or structure. The boards will not split during cutting or nailing. All of the boards are the same thickness to create a flush install. In each box of AS-IS Brand Wood Wall, there is a mixture of lighter and darker coloured boards to provide you with an eclectic mix. Have fun and let the projects begin!